Two new studies bring the total number of meningioma mutations identified thus far to five; the researchers believe that these account for most of these tumors. Mutations governing signal pathways in just five genes may be responsible for many meningiomas, according to two new studies by independent teams of researchers who used genome sequencing to probe for specific genetic alterations in nearly 400 tumors. The findings may offer potential targets for therapeutic intervention, and certain cancer drugs are already available or in clinical trials that address some of these defects. Surgery and radiation are the only current treatments. Meningiomas, the most common nervous system tumors, develop on the meninges, the layers of tissue surrounding the brain and spinal cord. Approximately 80 percent are low-grade, slow growing tumors, but they can exert pressure on adjacent cranial nerves and blood vessels as they grow. Up to 20 percent recur despite surgery, and their growth can cause disability and even death. Prior research has shown that the tumor suppressor gene NF2 (neurofibromin 2), on chromosome 22, is disrupted in about one-half of all cases, but the full range of other genetic changes has been unknown. However, taken together, the two new studies bring the total number of meningioma mutations identified thus far to five, and the researchers believe that these account for most of these tumors. In a Jan. 20 research letter published online in Nature Genetics, scientists at Harvard Medical School and the Dana-Farber Cancer Institute in Boston, reported the results of whole-genome analysis of 17 meningiomas using whole-genome sequencing or just the protein-coding regions (exomes), with focused sequencing in an additional 48 tumors. The researchers were able to confirm NF2 inactivation in 43 percent of the meningiomas studied, while changes in other genetic “modifiers” of cell growth were found in 8 percent. A larger international study, led by researchers at Yale University's Program in Brain Tumor Research, analyzed mutations in 300 meningiomas and found mutations in four new genes, each influencing the origin of meningiomas from different brain regions, in addition to the known defects in NF2. The study was published Jan. 24 in an online advance edition in Science. In the first study, researchers identified mutations in two genes, called SMO (the receptor-associated protein Smoothened) and AKT1 (serine/threonine-protein kinase) in 15 percent of the tumors. AKT1 is a growth factor mediator, while SMO is part of the “sonic hedgehog” molecular signaling pathway that controls stem cell division. SMO was found in three tumors, while AKT1 was discovered in five. AKT1 is part of the mTOR (mammalian target of rapamycin) gene pathway that controls cell growth and it has been associated with breast, colorectal and lung cancers. SMO has been associated with skin and brain cancers. A sixth tumor had a previously unknown mutation in the mTOR pathway. According to lead author Rameen Beroukhim, MD, PhD, assistant professor of medicine at Harvard Medical School and the Dana-Farber Cancer Institute, the meningiomas had fewer numbers of mutations or damage than most other types of tumors. Recurrent AKT1 mutations were found in tumors of the skull base, according to the review. Tumors with mutations in AKT1 and SMO lacked NF2 alterations and exhibited immunohistochemical signs of mTOR or hedgehog pathway activation. “The most important thing about our findings is that these two mutations account for around 15 percent of all meningiomas and there are already drugs that inhibit these abnormal pathways in clinical use,” Dr. Beroukhim said. Dr. Beroukhim, who is also a researcher at the Eli and Edythe L. Broad Institute of Harvard and the Massachusetts Institute of Technology, was one of three senior authors of the study. The others were William C. Hahn, MD, PhD, director of the Center for Cancer Genome Discovery at Dana-Farber, and Ian F. Dunn, MD, a neurosurgeon at Dana-Farber/Brigham and Women's Cancer Center. “We did not find significant correlation with meningioma grade or outcome —that will take larger studies — although we did identify an AKT1 mutation in one high-grade tumor,” he said. The second study was conducted by researchers at Yale University Cancer Center's Genetics and Genomics Research Program; Memorial Sloan-Kettering Cancer Center; and Acibadem, Marmara and Bahcesehir Universities in Istanbul, Turkey. Genome analysis of 300 meningiomas revealed alterations in TRAF7 (TNF receptor associated factor 7), a gene not previouly linked to cancer, in almost 25 percent of tumors, and a gene called KLF4 (Krueppel-like factor 4), which plays a role in inducing stem cell formation. SMO, NF2 and AKT1 mutations were also identified. SMO mutations have been linked to a certain type of skin cancer (basal cell carcinoma) and are targeted by a drug that has already been approved. Meningiomas with TRAF7 and KLF2 mutations were found in the skull base and are unlikely to become cancerous, according to the researchers. NF2 defects, in contrast, were found in tumors flanking the brain's hemispheres and tend to be more likely to progress to malignancy, especially in males. “The non-NF2 meningiomas were clinically distinctive — nearly always benign, with chromosomal stability, and originating from the skull base,” said lead author Murat Günel, MD, the Nixdorff-German professor of neurosurgery at the Yale University Cancer Center's Genetics and Genomics Research Program in New Haven, CT. The vast majority of atypical meningiomas were NF2-mutant, showing genomic instability and localizing to the cerebral and cerebellar hemispheres, he noted. Knowing the activity of these mutations and the location of a tumor has direct clinical relevance and may hasten development of personalized therapies, he said. That the two teams of researchers were able to find common mutations is unusual in whole-genome studies, commented Arie Perry, MD, professor of pathology and neurological surgery at the University of California, San Francisco. Moreover, with surgical excision the only option currently available to most patients with meningiomas, there's significant potential for targeted drug therapy in the near future, he noted. “These are two beautiful studies that add tremendous information to our emerging understanding of the genetics of meningiomas,” said David H. Gutmann, MD, PhD, Donald O. Schnuck Family professor of neurology, director of the Washington University Neurofibromatosis Center, and co-director of the neuro-oncology program at the Washington University School of Medicine in St. Louis. “The researchers have laid out a good part of the molecular landscape of meningiomas, which may one day lead to the development of drugs that target the growth control pathways de-regulated by these mutations,” he told Neurology Today. He also found it interesting that the teams identified some mutations in common, such as SMO and AKT1, but that the Yale researchers found mutations that the Harvard scientists did not. • Clark VE, Erson-Omay ZE, Günel M. Genomic analysis of non-NF2 meningiomas reveals mutations in TRAF7, KLF4, AKT1, and SMO. Science 2013; E-pub 2013 Jan. 24. • Brastianos PK, Horowitz PM, Hahn WC, Beroukhim R, et al. Genomic sequencing of meningiomas identifies oncogenic SMO and AKT1 mutations. Nat Genet 2013; E-pub 2013 Jan 20. 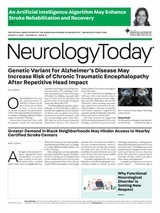 Neurology Today13(5):42-44, March 7, 2013.